Not all of my craft projects go…um…well. Here’s one of them. I’ve seen so many glittered wine bottles. I received a mini bubble bottle for Christmas AND a 12-pack of glitter from my mom, so I thought it was the perfect opportunity to try one of these sparkly crafts. I purchased some decoupage glue from Martha Stewart and tested my luck…. And it was almost all wrong. 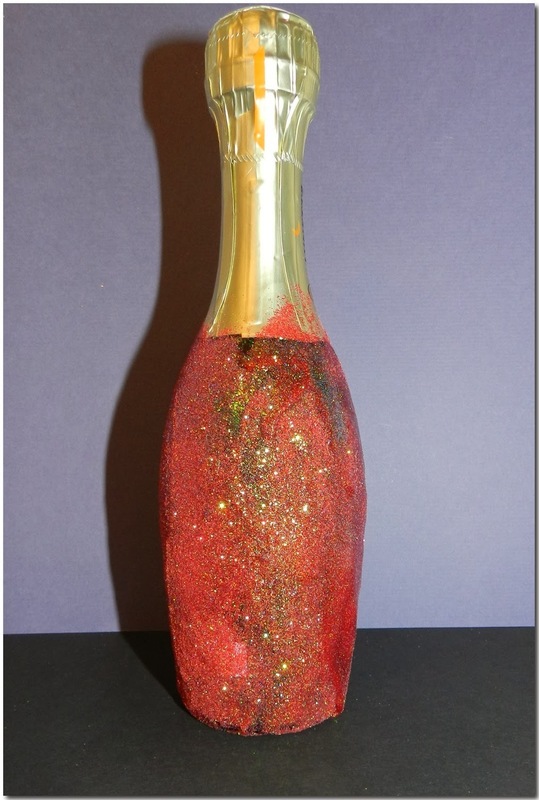 I added the clear decoupage glue to the bottle and then started to sprinkle on the glitter. I used a very fine glitter and it actually took A LOT to cover up the bottle. I tried to even out some of the glitter with a brush and it just started clumping up on me. I could have added a few more layers of glitter, but I decided to stop before there was another glitter bomb all over our apartment. I’d probably recommend NOT doing this. Just tie a bow on the bottle. Or glue gems. Pass on this craft! When you going to replace your old plastic bottle to the new Glass Bottles. So when you drink water from it then it will give you the new feel about drinking the water. And this will impress your guest also when you give water to your guest from it than your guest will really impress by seeing your status and personality of living lifestyle.